Kellyanne Conway, campaign manager and senior advisor to President-elect Donald Trump, talks with reporters as she arrives at Trump Tower, Saturday, Nov. 12, 2016, in New York. "President Obama had a six-month ban on the Iraqi refugee program after two Iraqis came here to this country, were radicalized, and they were the masterminds behind the Bowling Green massacre. Most people don't know that because it didn't get covered," Conway said. The Obama administration never banned Iraqi refugees or other Iraqi travelers from coming to the United States. That government did slow down the processing for Iraqi's being issued Special Immigrant Visas, which are given to translators and interpreters who worked with the U.S. in that country. That slow-down was prompted by the May 2011 arrest of two men in Kentucky charged with plotting to send weapons and money to al-Qaida operatives. Waad Ramadan Alwan and Mohanad Shareef Hammadi, were mistakenly admitted to the U.S. as Iraqi refugees in 2009 and resettled in Bowling Green, Kentucky. 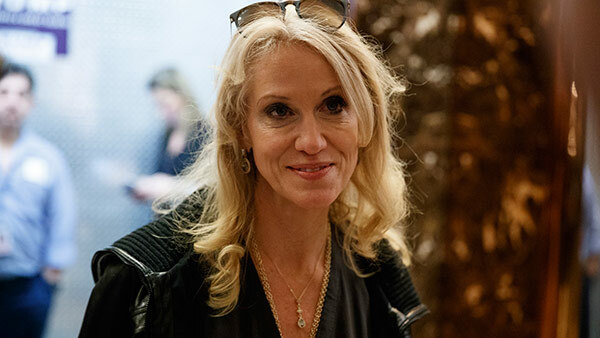 Conway's comments have made fodder for jokes among social media users. "Bowling Green massacre" quickly became a top trending topic on Twitter with a flurry of tweets mourning the nonexistent victims. The website BowlingGreenMassacreFund.com appeared online Friday. A "Make a donation" link clicks through to the American Civil Liberties Union, which is fighting Trump's immigration order in court.